Saturday October 31st 1931 I was busy all forenoon with unpacking &c Hattie & Cora came for me late in the afternoon I was there for supper. Rob brought me home. Sunday November 1st 1931 Went to S. S & Church with Ott and home with him for the day A great visit. I wrote Ida while there. William & Mary brought me home. Monday November 2- 1931 I did some washing and got my dinner Hattie came early in PM. We went out east. She stopped at Mrs Grants. I was at Ida Andersons and over to Aunt Emmas to see Mary Price. Hattie went there too. Then came to Idas. Rob brought us home. 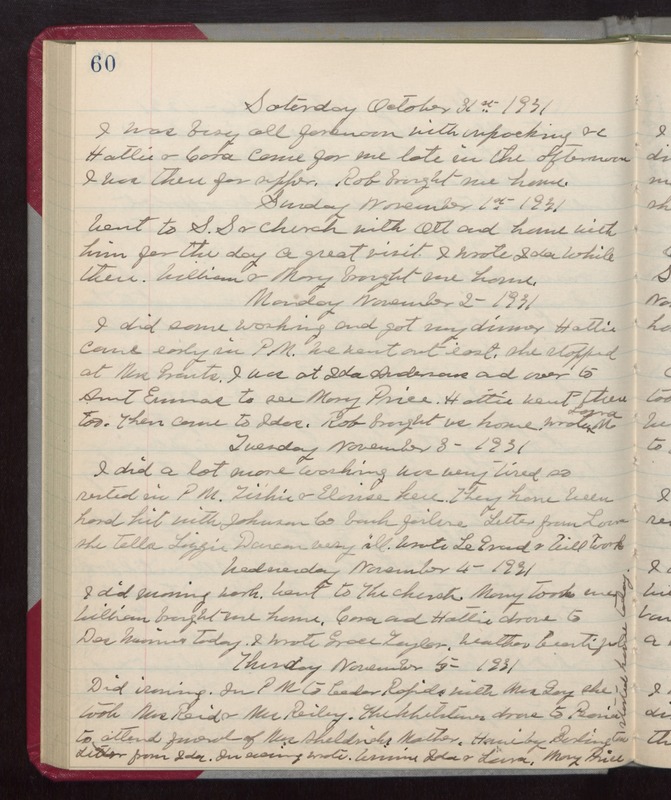 Wrote Laura M Tuesday November 3- 1931 I did a lot more washing Was very tired so rested in PM. Tishie & Eloise here. They have been hard hit with Johnson Co bank failure Letter from Laura she tells Lizzie Duncan very ill. Wrote Legrand & Will Work Wednesday November 4- 1931 I did morning work. Went to The Church. Mary took me. William brought me home. Cora and Hattie drove to Des Moines today. I wrote Grace Taylor. Weather beautiful. Thursday November 5- 1931 Did ironing. In PM to Cedar Rapids with Mrs Gay She took Mrs Reid & Mrs Reiley. The Whetstones drove to Peoria to attend funeral of Mrs Sheldricks Mother. Home by Burlington Letter from Ida. In evening wrote Winnie Ida & Laura. Mary Price started home today.